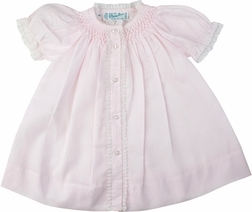 An angelic and sweet Feltman Brothers day gown in pink for your precious baby girl. This Feltman baby infant day gown has a traditional and vintage feel with its hand smocking along the yolk and French lace ruffle around the neck, the puffed sleeves and on the front button placard. It is further embellished with a beautiful rose and vine embroidery on the placard.